Short Avenue Girl Scout Troop 5265 is hosting Operation Gratitude Halloween Candy Give-Back November 1 and 2. It is the perfect way to put some of your candy haul to good use and honor our troops. In addition to candy collection, travel-sized toothpaste and dental floss will be collected. There is also a special need for letters specifically written to New Recruits, Veterans, and First Responders. Learn more about writing a letter. Drop off your candy, dental floss, travel-sized tooth paste and letters in the main office Thursday and Friday, November 1-2 between 7:30-3pm. Short Avenue Elementary is the fortunate recipient of tickets for the Los Angeles Ballet’s Modern Moves, a series of three powerful choreographic interpretations from master choreographers of the 20th and 21st centuries. Our evening performance is this Saturday, October 13, in Royce Hall at UCLA. You must RSVP in the front office if you are certain you can attend. Starting Tuesday, there will be a sign-up sheet that Hector Garcia (310.397.4234) is managing. You must coordinate with our Royce Hall point person* and pick up tickets 1/2 hour before the performance starts. 50 tickets are available. Priority will be given to families who have not yet attended. *One person from our school must commit to being the point person for Short Avenue. Please reply to this email if you can be the designated person to disseminate the tickets. The tickets are at Will Call under Alicia Casilli. NOTE: There have been issues with “no shows” and Short Avenue will not be offered this privilege if we have no shows. Arrive by 7:00pm at Royce Hall and locate our Short Avenue point person near Will Call (a folding table) to get your tickets. The performance starts precisely at 7:30pm. Royce Hall is located at 340 Royce Drive, Los Angeles, CA 90095. Remember to allow at least 15 additional minutes to park. Parking costs $12. Find directions to Royce Hall here. Please contact Alicia with any questions. We are grateful for our partnership with the Los Angeles Ballet and for sponsoring these tickets so generously. Short Avenue Elementary School is thrilled to participate in the LA Clippers Read to Achieve program. From October 1 through November 9 students will track the number of minutes read during this six-week period and they can win awesome prizes. 📚 All (TK-5) students who read 1000+ minutes and middle school students (6-8) who read 1500 minutes will receive special prizes + a certificate of completion. 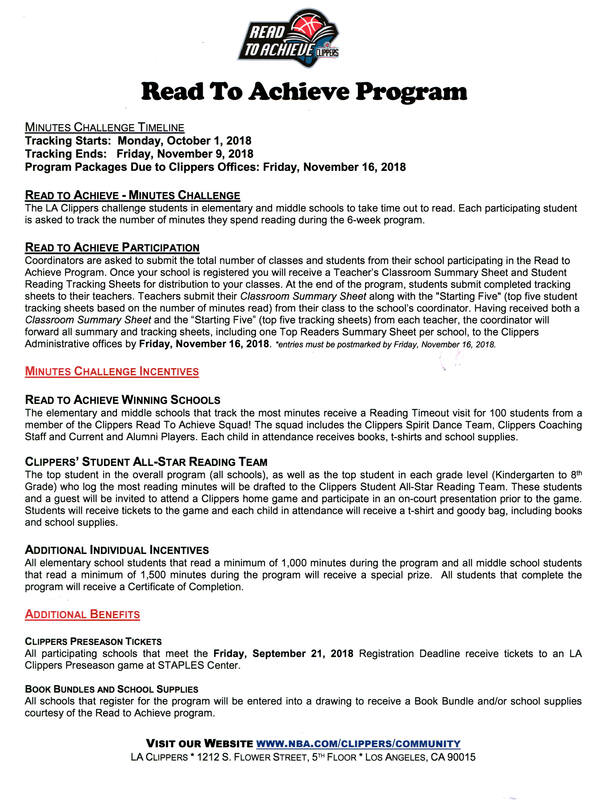 📚 The top student in the overall program as well as the top student in each grade level who logs the most minutes will be drafted into the Clippers Student All-Star Reading Team and will be invited (+one guest) to attend a Clippers home game and participate in an on-court presentation prior to the game + t-shirt + goody bag with books & school supplies! 📚 The elementary school with the most minutes logged will receive a Reading Time Out visit for 100 students from a member of the Clippers Read to Achieve Squad, + books, +t-shirt + school supplies. Encourage children to read every day and track their progress. Teachers may need help tracking student progress. Ms. Casilli, our school librarian is the program coordinator. Please see her with any questions. If you need extra forms to track your progress, download reading logs here. All schools registered for the program will be entered into a drawing to receive a Book bundle and/or school supplies courtesy of the Read to Achieve program. 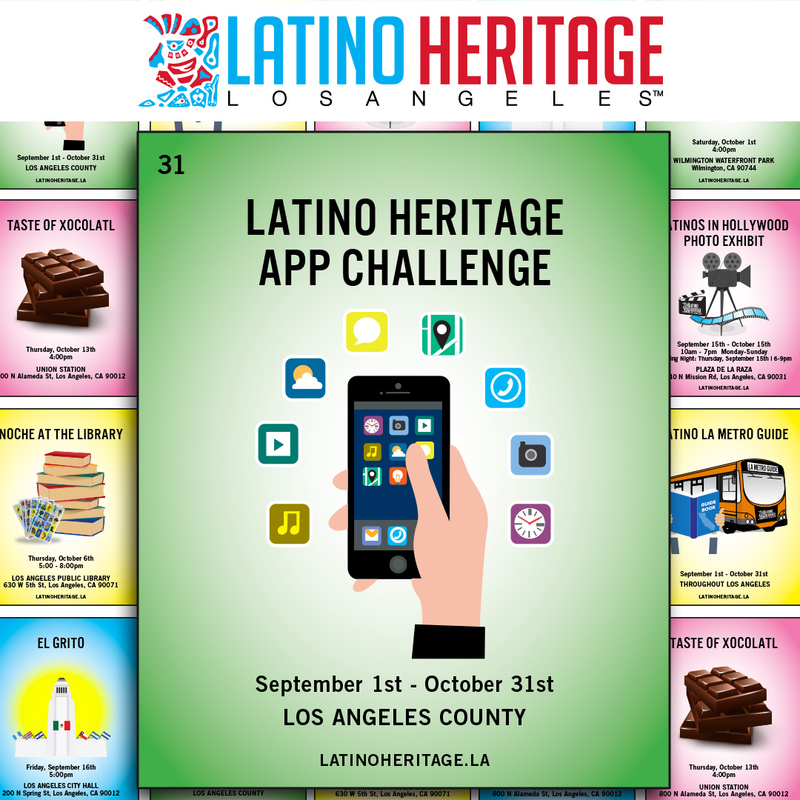 LA App Challenge 2018 📱 is Here! Do you have an IDEA how to improve the lives of people living in LA? Short Avenue Elementary K- 6 students are challenged to create an idea for a brand new mobile app that improves the lives of Los Angeles residents. It gives students the opportunity to identify a problem in their community and create a solution using technology. This challenge engages students in STEM principles, encouraging them to delve into the world of innovative technology. 1. What issue is your app addressing? 2. Why is the issue important to you and the lives of residents in Los Angeles? 3. How will your app address the issue? 4. How does your app celebrate your talent and history? Student applications may include sketches, demos, screenshots, and/or videos, though not necessary. This challenge is open to all California students in grades K-12. There will be three categories of submission: Elementary, Middle School, and High School. Each category will be judged separately. A First, Second and Third place winner will be selected from each category. First place winners will be awarded a savings bond. Submit your idea(s) before the deadline on October 31. Students are encouraged students to discuss their ideas with their families. Ms. Casilli, our librarian, will help students with online submissions. Stay for the First Fridays monthly awards assembly (including 25 Golden Ticket Winners) on the yard at 8am. Mrs. Nelson’s Book Fair offers a wonderful selection of diverse reading material for students and their families. The Book Fair kicks off on Friday, August 24. Money earned from this Book Fair will go directly to enriching the educational experience of every student while also supporting Short Avenue’s Friends and Family library Media Center. Look for the Book Fair flyer in your child’s homework folder this week. There will be a golden ticket drawing to win books or posters. Every student will be given the opportunity to win a book and will receive one golden ticket. Students must deposit the ticket into the collection container when they visit the Book Fair. There will be 25 winners! The Book Fair runs from Friday, August 24 through Thursday, August 30 at 1:00pm. Students and teachers will preview the Fair on Thursday, August 23. We are open during recess (10:20-10:45am) and lunch (12-12:50pm), and after school daily for 1/2 hour, plus Back-to-school night on Tuesday August 28 from 5:00-6:30pm. Do you have a spare hour to help us? We could really use your assistance with our Book Fair. Please contact us for more information or to volunteer. Set-up is Thursday, August 23, 8-10am. All profits directly benefit every student at Short Avenue while also supporting the library. Our library needs major resources. 68% of our library collection is considered aged (with most books 30-40 years old) and prior to 2014 more than $25,000 in books were lost. We are 42% under the recommended amount of books for elementary school students. Every Book Fair purchase helps our students and our school! This is a school-run Book Fair. 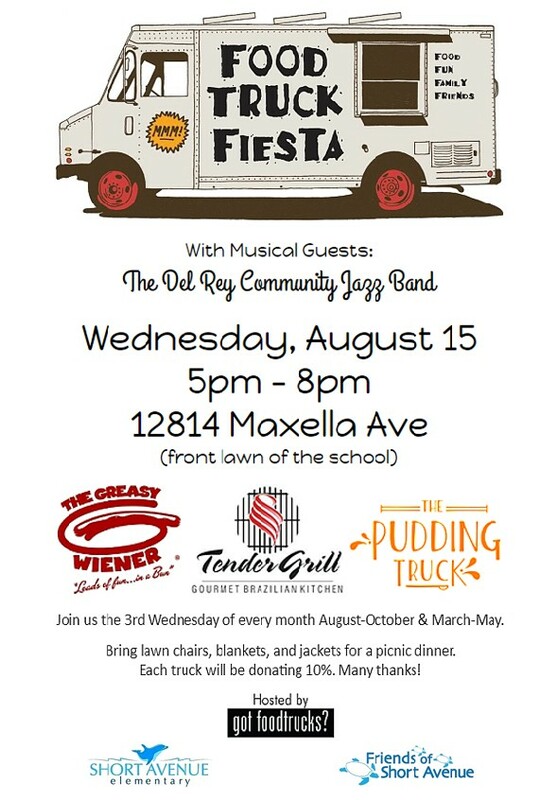 To kick-off the 2018-2019 school year, Short Avenue is hosting three fabulous food trucks + a live concert featuring the Del Rey Community Jazz Band on Wednesday, August 15 starting at 5pm on the front lawn. Relax with new and old friends, let the children play, and enjoy a tasty picnic style meal with savory and sweet treats on a warm August evening. Short Avenue’s Food Truck Fiesta is the third Wednesday of the month during day light savings times. Calling all friends and families! 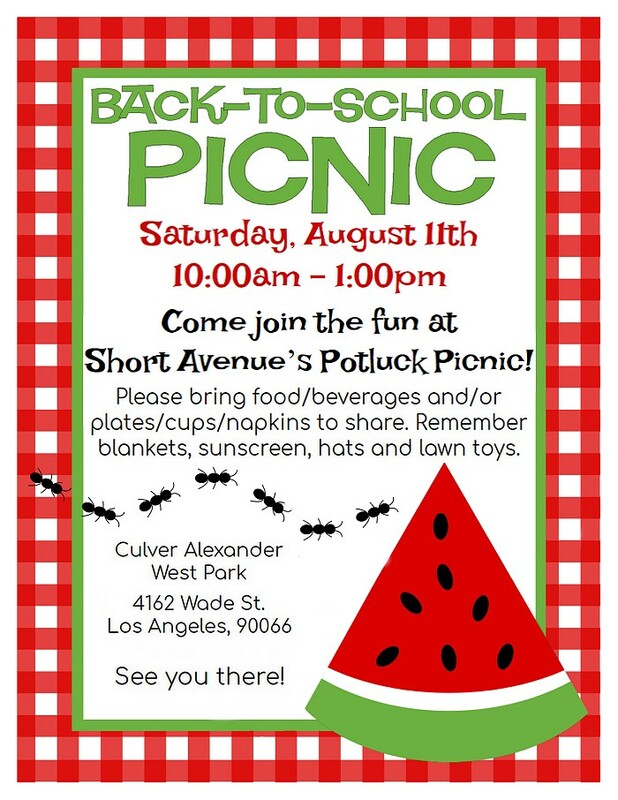 Everyone is invited to Short Avenue Elementary’s Back-to-School Potluck Picnic Saturday, August 11 from 10:00 til 1:00pm at Culver Alexander West Park off Moore Street. Look for the happy families near the blue canopy. Please bring food/beverages and/or plates/cups/napkins to share as we welcome new and returning families and friends. Remember blankets, sunscreen, hats and lawns toys. We can hardly wait to see you! Season’s Greetings Short Avenue Families! We are, once again, fortunate to be the recipients of tickets for the Los Angeles Ballet’s The Nutcracker this year. Our matinee performance is this Sunday, December 17, in Royce Hall at UCLA.You must RSVP in the front office if you are certain you can attend. There is a sign-up sheet that Hector Garcia (310.397.4234) is managing. You must coordinate with our Royce Hall point person, Olma Leon and pick up tickets 1/2 hour before the performance starts. 75 tickets are available. Priority given to families who have not yet attended. Arrive by 12:30pm at Royce Hall and locate Olma Leon near Will Call (a folding table) to get your tickets. The performance starts precisely at 1pm. Please contact Alicia Casilli with any questions. NOTE: There have been issues with “no shows” and Short Avenue will not be offered this privilege if we have no shows. We are grateful to the Los Angeles Ballet and their partnership with Beyond the Bell for sponsoring these tickets so generously. Thank you to our wonderful community for supporting our Short Avenue Book Fair! The Fair is open all week long with special hours on Wednesday after the parent meeting and Friday after the Dolphin Cafe and assembly. All profits directly benefit every student at Short Avenue while also supporting the library. Our library needs major resources. 67% of our library collection is aged (with most books 30-40 years old) and prior to 2014 more than $25,000 in books were lost. 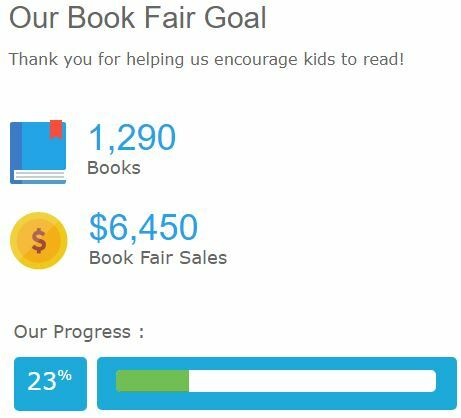 We are 52% under the recommended amount of books for elementary school students. Every Book Fair purchase helps our students and our school! Online shopping is open through midnight, October 6. The last day of the Fair at school is October 6. This Book Fair is managed through Short Avenue Elementary school and is not a FoSA fundraiser.